Devices such as smart phones and tablet PCs of various sizes have become increasingly popular, finding new applications, including in-car audio systems. This paper proposes a new car audio system. In the architecture, music data is stored in an online database, which users are then able to select a genre of music or a playlist from through a 2D interface. Self-organizing map, depending on a personalized distance function and music contents, is utilized to map music tracks to the interface. With this data model and interface, drivers can easily select the type of music they want to listen to without interfering with their driving. Artificial neural networks record and analyze user preference, allowing the system to select and order the music tracks to be played automatically. Experiments have shown that the system satisfies user requirements. New vehicle telecommunication systems are constantly being developed. The problem of combining multimedia player technology with in-car systems has recently attracted significant attention. Among car-based multimedia systems, personal music and radio are less distracting for drivers and are thus the oldest and most popular types of in-car entertainment. The wide availability of third generation (3G) mobile networks has also enhanced car audio systems. A new type of Internet radio for vehicles has recently been released. It offers advanced radio functionalities including: AM/FM radio, CD, and MP3 playback, along with Internet radio. In the not-too-distant future, it is predicted that music will be stored in the cloud , in contrast to how it is currently stored locally, and will be accessed over wireless networks. However, this creates a new problem. The driver's primary focus needs to be on driving. If the driver spends too much time and attention on selecting music, there is an increased risk of accidents. Therefore, designing a new user interface to facilitate the selection of music from large databases is an important research topic. The original method to select a track on a car audio system is achieved using the ‘Next,’ ‘Previous,’ and ‘Random’ buttons. Newer music players often have a touch screen to let users look through albums or folders and find the desired songs. The former method is time-consuming, and the latter involves a number of interactions, distracting the driver and creating a safety issue, especially when the number of tracks is large. In this paper, a novel music selection interface is proposed, which utilizes the self-organizing map (SOM) to map tracks to one or two discrete grids. Users only need to press the appropriate spot on a touch screen corresponding to a particular type of music or slide their finger on a curve to create a playlist. A content-based method is adopted that uses musical content as the basis for the SOM clustering. Since each individual perceives the variation between certain music tracks differently, a dynamically adjustable measure is proposed. From here on the variation in music tracks perceived by the user is referred to as a distance function. The proposed method can calculate the users' implicit distance functions based on the ratings they give for the distances between music tracks. The distance function is then used to quantify the music similarity and is needed for the music clustering process. The superior clustering capability provided by the SOM is used to create a personalized index and interface for each user. In addition, an artificial intelligence technique is adopted to select tracks automatically to recommend to users. 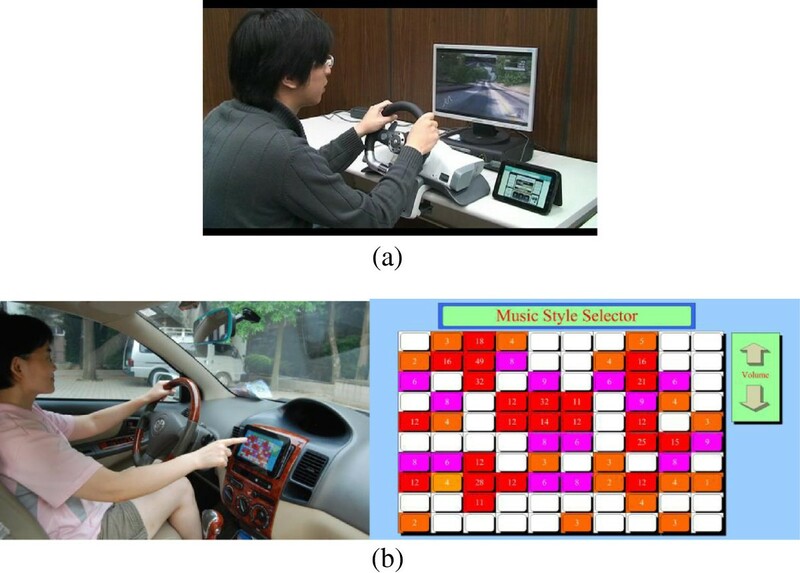 This car audio system and interface is implemented in experiments, to test the influence of the personalized distance function on the clustering performance, and the tracks retrieved. The clustering method and interface design are suitable for the next generation of car audio systems according to the experimental results. The proposed car audio system is illustrated in Figure 1. All music data are stored in the music server. The system first utilizes the Internet to estimate the user's perception of ‘music distance’, which will then be used to generate a personalized distance function. The SOM clustering method is applied, with this distance function, to generate a personalized interface that is transferred to the in-car system through a 3G connection. The user will select the type of songs to play on the car system. This choice is sent to the playlist generator on the server side, which finds appropriate songs to transmit to the car. The rest of this paper is organized as follows: Section 2 discusses related work. Section 3 discusses feature extraction from the music content and the method used to generate the distance function. Section 4 describes the design of the music clustering method and the user interface. Experimental results are presented and discussed in Section 5, while Section 6 concludes the work. As more and more electronic devices are installed in modern vehicles, the I/O systems become increasingly important. The use of car navigation systems is an example of this. In Kern et al. , it was found that input and output device controls should be in the middle of the steering wheel for safety and suggested that multi-touch screens be used. However, it is not clear how the content of the screen was to be kept horizontal. Although a round screen that adjusts content along with the rotation of the steering wheel can be used , the cost is too high to commercialize and also prevents the installation of airbags. A study of car audio system interfaces  proposed mapping the control commands to a similar system as the fingerings of chords. The buttons on the steering wheel when pressed in certain patterns could then implement complex controls. In Schnitzer et al. , the design of a music player interface using the travelling salesman problem algorithm to sort tracks from most similar to least similar, circling round to more similar again, was demonstrated. In this way, tracks are arranged in an optimal and non-repetitive circular order, forming the interface. In Prescher et al. , a method was proposed to cleanly partition the touch-screen area. The interface needs to be convenient and easy to use and the touch-screen area should display information clearly. In Alonso et al. , the complexity of touch-screen interfaces was discussed, where it was suggested that it is better to use fewer steps for interaction. Rauber et al. used ‘islands of music’ to visualize music based on a distribution of features. However, they did not address the problem of playlist generation. The SOM, which was first proposed by Kohonen, is one of the best known unsupervised artificial neural network models [9, 10]. The SOM is a competitive learning algorithm, which looks for similar patterns, features, and relations among samples. The SOM can be used for data classification or clustering. After clustering using the SOM algorithm, an arbitrary dimensional input vector can be mapped to a lower discrete grid (usually one- or two-dimensional (2D)). The SOM retains most of the distance relations which were present in the original data in this lower discrete grid. There is a large body of research on the SOM. Some studies focus on improved algorithms for faster convergence, such as the fast SOM method proposed by Su and Chang , who added the k-means algorithm to obtain an initial clustering, which was used to speed up the convergence of the SOM learning. In Su et al. , it was proposed to use grid partitions to replace k-means. 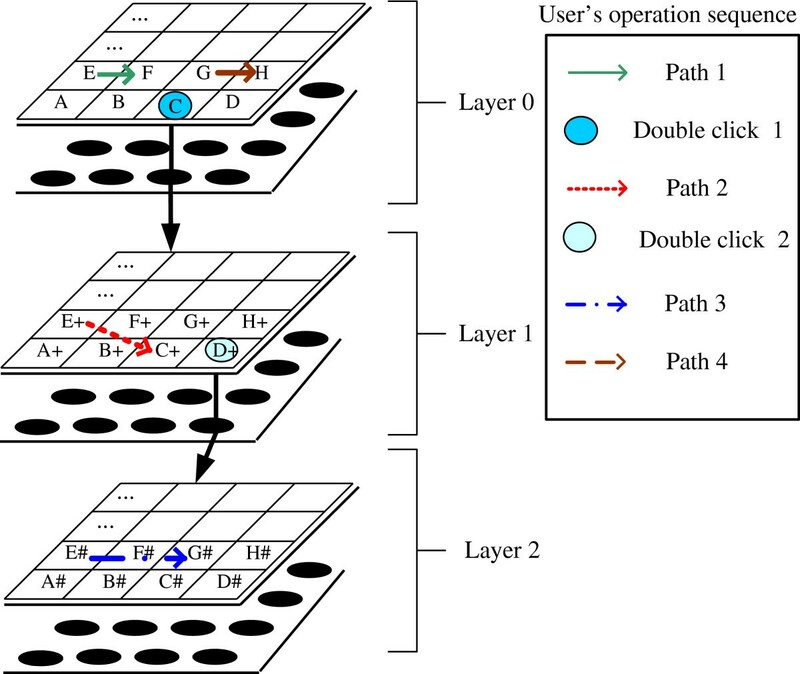 A hierarchical self-organizing map (HSOM)  uses a multi-layer architecture that splits the original single layer neuron network into multiple layers. After the upper layer, parent neurons are trained, their child neurons are trained, etc. 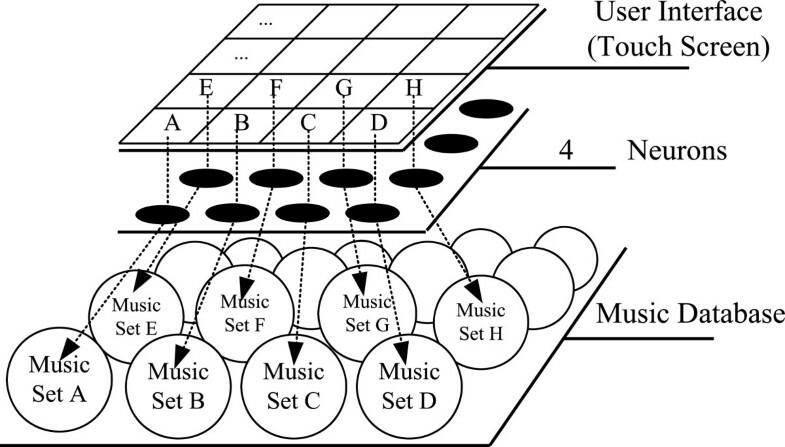 Due to the superior clustering performance of the SOM on high-dimensional data, it has been employed for music data clustering, recommendation, and querying. The SOM-enhanced JukeBox, proposed by Rauber et al. automatically creates an organization of music archives based on audio similarity. In Dickerson , the SOM was used to describe the properties of music and created a query-by-content system that operates independent of the user's query style. Concurrent recommendation systems can be categorized into content-based filtering (CBF) recommendation, collaborative filtering (CF) recommendation, and hybrid recommendation, based on the underlying algorithm. Research has focused on implementing effective music management and categorization using features such as metadata. Others proposed content-based methods [15, 16] generate recommendations by identifying preferred content features and extracting items similar to previous choices. Lyric feature analysis  is used to find similar items, focusing on lyrics that describe race conflicts and social issues. The authors proposed a content that features analysis-based customer playlists, generated according to user profile and feedback information . The CF mechanism uses rating and user profile information to identify users with similar interests. Users with common interests recommend items to each other. The CF mechanism is a widely applied recommendation technology [15, 19] where user preferences are obtained from visitor records or browsing behavior. Although the CF mechanism is widely used, it has many unsolved problems, such as the cold-start problem and sparse information, which affect performance during system initialization. Several researchers have proposed recommendation methods that combine both CBF and CF approaches to build a recommendation system. The hybrid approach is able to partially solve some of the problems associated with recommendation loss. For example, collaborative user groups are constructed based on tagged labels [16, 20]. Users who have tagged the same label are included into the same group. The initial grouping can reduce calculation time. Further analysis is based on music content and is aimed at providing mutual recommendations. For playlist generation, a popular method allows the user to specify some tracks as seeds. The algorithms then find similar music and make a list . A similar example  creates playlists with an inherent sequential order to have a smooth transition between the start and end of each song. Another approach to playlist generation populates the playlist according to a set of user-specified constraints about the desired content . A third method generates a playlist according to user preferences and situations . The system produces a playlist for users in similar situations using content-based retrieval on the playlists. These three methods rely on examining metadata attached to music tracks. Another method uses the listening history of the user and generates a listener model for the user's preferences. For instance, the system proposed by Andric and Haus  records the frequency of two music tracks being played together to find the relevance between them. A vector space is constructed where each vector represents a track. The vectors are then grouped such that each grouping of the tracks indicates different listening situations. The music playlist is then generated according to the situation indicated by the user. 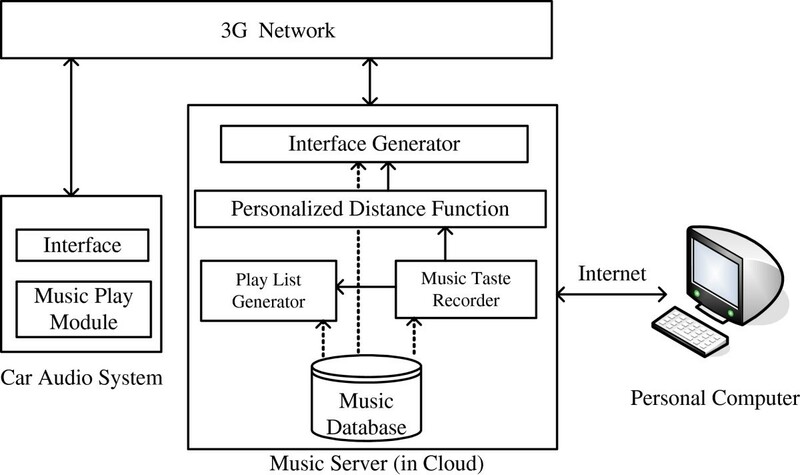 Another method to generate a playlist was proposed based on users' interests and time parameters, utilizing personalized neural networks in Liu and Hsieh . The results of music clustering are often affected by the distances between them. In this paper, we design a mechanism to build a personalized distance function for each user. Simple surveys are used to record user perceptions of the distances between songs in order to achieve personalization. The personalized distance function forms the basis for generating the personalized interface. Average pitch indicates whether the piece of music is of high or low pitch. Pitch entropy indicates the degree of variation in the piece of music. Pitch density represents the number of different pitches that occur in the piece of music. Average duration describes the rhythm of the piece of music, for example fast or slow. Duration entropy indicates the degree of variation in rhythms present in the piece of music. 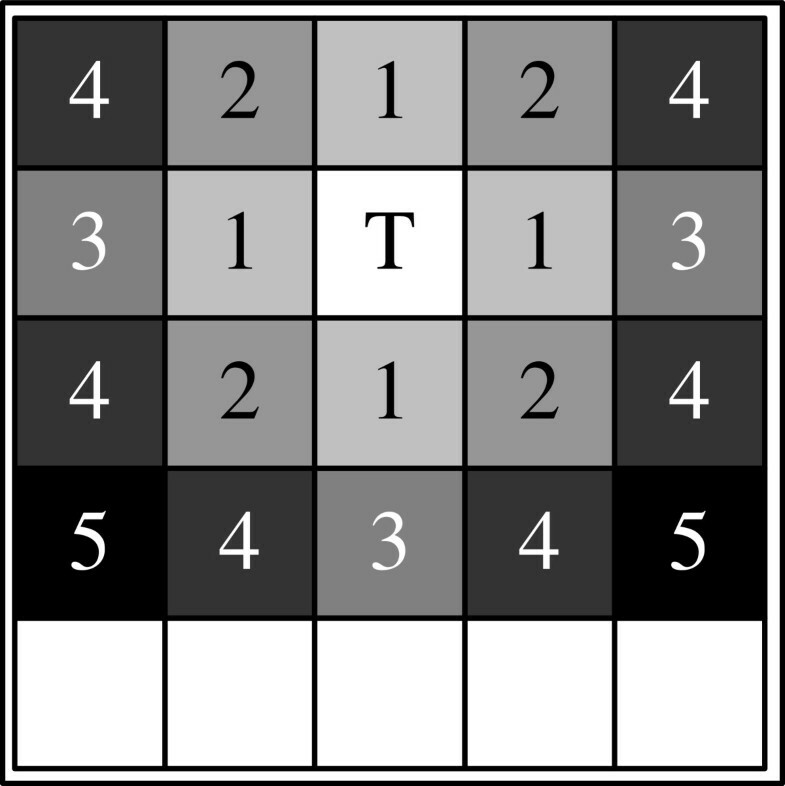 The pitch interval represents the difference between consecutive pitches. It is commonly used in key-invariant music query systems, which are not based on pitch. Extracting features from a pitch interval string is useful since two melodies with the same pitch contour may be considered identical even when they have different pitch scales. Pitch interval entropy represents the degree of variation in the piece of music under key-invariant conditions. Refrains in pop music are common. They often form the basis by which people decide if they like a music track. Therefore, the same set of features is extracted from refrains. In total, 12 features are utilized from MIDI files. For audio files, the features are extracted from the frequency domain, which include formants and Mel-frequency cepstral coefficients (MFCCs). As pop music is the most common, the tone color (or timbre) of the singer's vocals is a possible feature in determining whether the user accepts the recommendations. The vocal sections are manually identified (usually in the refrain) for formants. MFCC is the best-known feature in the area of speech and speaker recognition, based on human perception sensitivity in terms of audio frequencies. In this system, the input signal of the entire track is segmented into 20 ms frames with an optional overlap of 1/2 the frame size. Only the first five bins of MFCCs are extracted; this avoids high-dimensional data. The average and the standard deviation of each bin are calculated as features. Formant. Vocals are usually evaluated based on formants. Formants are the frequencies that have higher energy or amplitude in the spectrum. For example, the formant of a female voice is typically higher than a male voice. To limit the number of features, only the first (F1), the second (F2), and the third (F3) formants are used because they are more useful for distinguishing between different sound sources. The mean and standard deviation of F1, F2, and F3 within a window are calculated for use as the features of the specific vocalist. A total of 16 features are extracted from the audio file, and together with the features extracted from the corresponding MIDI file, the feature vector of a piece of music contains 28 dimensions. where d is the value to be normalized, Dmax is the maximum value for this dimension, and Dmin is the minimum value in the dimension. In a music clustering system, the distance formula usually determines the performance. Therefore, a method to personalize the distance formula is proposed. This is the subject of the following subsection. Most research on content-based music recommendation has adopted the Euclidean distance function  (Euclidean distance is a special case of the Minkowski distance). When using the Euclidean distance to measure music similarity, each dimension is given the same importance. However, each music feature has a different impact on the similarity measure. For example, rhythm is usually more important in similarity calculations for rock music than it is for classical music . Taking the weight of each dimension into consideration in the Euclidean distance calculation gives the weighted Euclidean distance. To limit the computation, the square root is not calculated. Instead, the weighted squared Euclidean distance is used as the music distance. As every user has a different rating, the weight is separately computed for each. where x n and q n are the n th-dimensional values of the feature vectors of tracks X and Q, respectively. where mi,n is the n th-dimensional value of m i , and q n is the n th-dimensional value of Q.
where w’n,t is the re-weighted value of the n th dimension of W in round t.
After recording the user's perception of distances through surveys, the above formula is utilized to obtain the personalized distance function. This function forms the basis for music clustering in the next step. The SOM is capable of mapping multi-dimensional data into one- or two-dimensional neurons and is hence ideal for selecting music and generating playlists. First, the personal distance function obtained in the previous section is used to select the winner neurons in the SOM and cluster all the songs according to their feature values. This two-dimensional space is then displayed on the touch screen of the car audio system. Users can press or slide their finger on the touch screen to select songs or playlists. Step 1: Initialization. Set initial synaptic weights of neurons v∈ V (V is the set of neurons) to small random values, in the interval [0, 1]. Assign a small positive value to the learning rate parameter α. Set j and k as the linear decay functions. R is the radius used for determining neighbors. where ΔC iu (p) = α × [x i − C iu (p) × w i is the weight correction in iteration p. w i is the weight of dimension i in the personal distance function. Increase p by 1, return to Step 2 and continue until the criterion is satisfied, or no noticeable changes occur in the feature map. Suppose there are n × n neurons in a two-dimensional SOM. After the SOM clustering is complete, the tracks in the database will be clustered based on content, into at most n × n clusters. As shown in the example of Figure 2, the SOM has 4 × 4 neurons, resulting in a division into a maximum of 16 clusters (the SOM with 4 × 4 neurons is only an example for illustration purposes, and in the actual experiments, a 10 × 10 grid was utilized). To generate the user interface, the screen area is divided into n × n regions, i.e., one for each neuron. 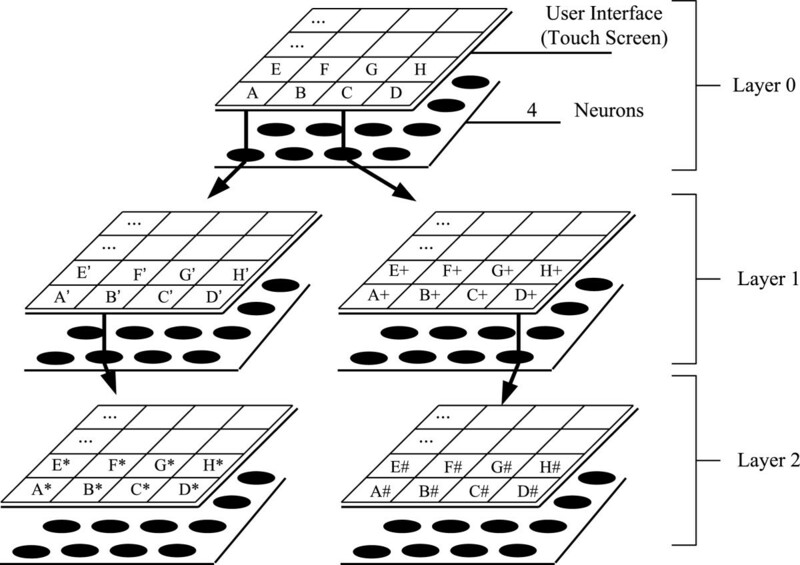 When the user presses a particular region of the touch screen, a cluster of tracks corresponding to that neuron will be retrieved. For example, if the user selects region A, the system will play tracks from Music Set A. If region B is selected, the system will play tracks from Music Set B, etc. The system randomly chooses tracks from the selected music set to play. Sample interface of the SOM clustering. There are two problems that need to be solved in the above design. (1) According to the characteristics of the SOM clustering, some neurons may not be winner neurons of any tracks. Therefore, when a user selects that region, there will be no tracks to play. (2) Some clusters may have a large number of tracks, which may have widely varying characteristics. To address these problems, two strategies are proposed as follows. The neurons after the SOM clustering have a property, i.e., the sets corresponding to nearby neurons are usually closer than the sets corresponding to far away neurons. Taking Figure 2 as an example, the distance between Music Set A and Music Set B is smaller than the distance between Music Set A and Music Set G because their corresponding neurons are closer. Using this property, if the selected neuron has no relevant tracks, the closest neurons are checked in order until a neuron is found that has relevant tracks. In Figure 3, an example with 5 × 5 neurons is shown. Suppose that the user pressed region T, and region T contains no tracks. To find a track to play, the neighboring regions are searched in their numbered order, until a region with tracks is found. If several regions in the same level all have tracks, the distances between the neuron vectors of these regions and the vector of neuron T are calculated, and the tracks are selected in the nearest neuron as candidates. If more than one neuron is equally close, a neuron is picked at random. Example for searching songs from neighboring regions. The weighted squared Euclidean distance function is used in the formula. Since many tracks may be clustered to the same neuron, those tracks are clustered further in the next layer. In other words, the multi-layer clustering algorithm, HSOM, is adopted for clustering songs. Assume that the maximum number of tracks that can be clustered to a neuron is m. If there is a cluster with size larger than m after the upper layer SOM clustering is complete, another round of SOM clustering for those tracks is performed in the next layer, as shown in Figure 4. In layer 0, the A and C clusters have more than m tracks, so they are further clustered in the next layer. In layer 1, B’ and D+ also have too many tracks, and so they are also further clustered. The limit of tracks that can be in each cluster can be different for each layer. Example of using HSOM clustering for interface design. With the music index generated by the HSOM, an easy method for selecting tracks is provided to the driver, which avoids the effort needed for browsing multiple layers of neurons. The operation is as follows: the user selects a neuron in the upper layer SOM. If the user double clicks the region of that neuron and it has a lower layer SOM clustering, then the lower layer is displayed. This process is repeated until the user does not double click any more or the bottom layer of the HSOM is reached. Finally, tracks belonging to the last neuron are treated as candidates. The selection of music from candidates can be randomized or be made using artificial intelligence. The artificial intelligence-based method is discussed in subsection C.
In addition to pressing regions of the touch screen, the driver can also draw paths on the screen. The system will then use these paths to generate a playlist. Figure 5 shows an example. The user draws three paths on the screen. The system can arrange songs in the playlist according to the types forming the paths. 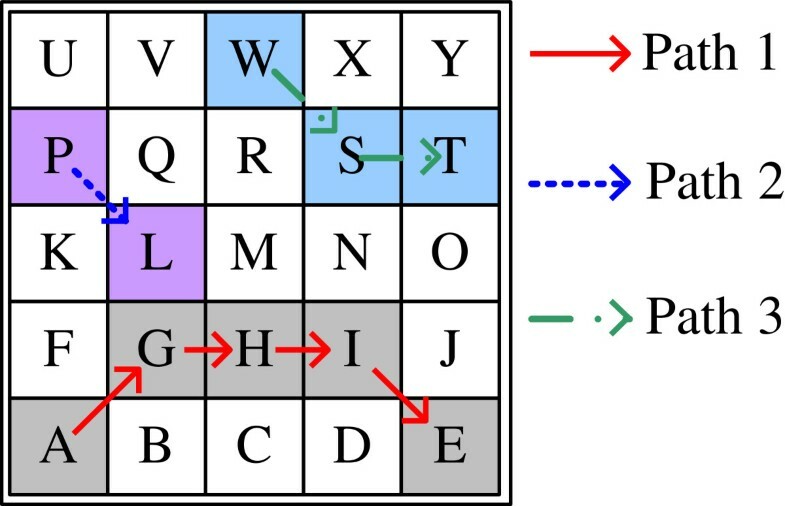 In this example, the types are ordered as follows: A->G->H->I->E->P->L->W->S->T. If the region covered contains no tracks, the procedure is processed as discussed in the previous section. User interface and sample operations. If the user does not want to generate a playlist in the first layer, they can make more detailed selections on the lower layers. Take Figure 6 as an example. The user first draws a path going through regions E and F on layer 0, then double clicks region C. The system will display the next layer of clustering on the screen. The user continues to draw a path going through the E+F+B+C+ sub-clusters, which all belong to cluster C. Next, the user double clicks region D+. The sub-clusters of D+ are displayed on the interface, and the user draws a path through the F#E#G# regions. Next, the user returns to layer 0 (two-finger slide input is defined as returning to the last layer) and draws a path through the G and H regions. The above operations will generate a playlist with tracks in this order: E->F-> E+−>F+−>B+−>C+−> F#->E#->G#->G->H. Sample music selection operation on the interface with HSOM clustering. In the previous section, how to select certain categories of tracks is discussed. When there are too many music in some categories, the SOM clustering can be applied multiple times, but it takes longer for the driver to select tracks if there are too many layers. Therefore, the number of layers in the HSOM is limited. For tracks in the same categories, two strategies are designed to select the tracks to be played. The first strategy is fast and does not require data to be collected beforehand. The second one uses artificial intelligence to select the tracks. The above method is simple, but it does not take user preferences into consideration and may play a track that the user does not like, which may distract the driver into changing the music. To address this problem, an intelligent mechanism should be developed. This mechanism can select tracks that the user will likely want to be played based on past user preferences. Typically, this kind of intelligent mechanism requires collecting user preferences, i.e., the driver would need to rate the tracks played. However, as it is not easy to rate music when driving, the ratings are recorded when the vehicle is stationary. For example, when the driver uses a PC at home or another hand-held device to listen to music, they can rate the music. The decision about not allowing drivers to rate music while driving is made in the interest of safety. The input data for music selection engine includes the attributes of the music features. After the engine evaluates these inputs through an intelligent mechanism, it outputs the predicted value, which dictates user preference for the musical piece. This value can be regarded as the class label in the prediction process, a type of classification. Artificial neural networks (ANN) have been adopted as the core of the music selection engine in this work due to its ability to classify continuous values (i.e., the values of input features). 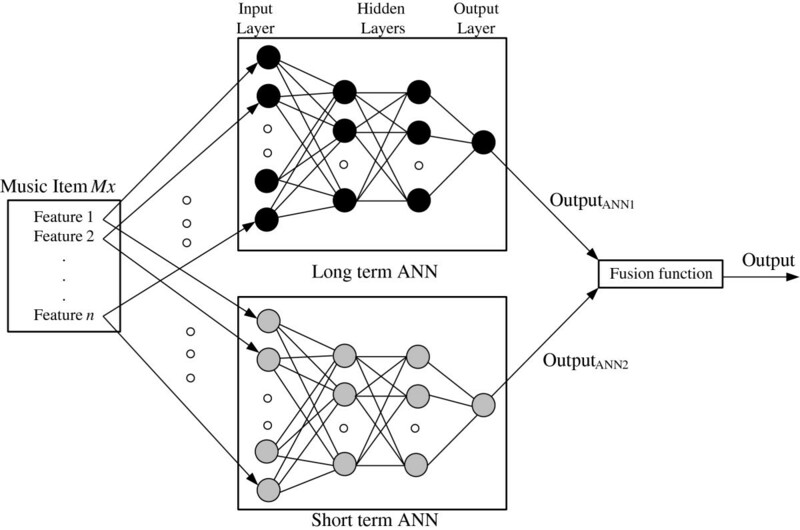 Training data of artificial neural networks. In order to enable the neural networks to learn user preferences, the system lists scores with the associated music file name (or ID). As shown in Table 1. The kernel of the playlist generator: a mixed ANN. The previous method from  is utilized. The training time of the ANN can be higher than normal in two cases: firstly, when the training set data for an ANN have higher dimensionality or consist of a larger amount of training samples, and secondly, when the prediction does not satisfy the user requirement and hence new feedback is recorded to retrain the ANN. Retraining the system takes time if all the user data are used as the training sample. To reduce the retraining time, the structure is modified as shown by Figure 7. This structure includes two ANNs: a short-term ANN and long-term ANN to record the user's short- and long-term preferences, respectively. The structure of a personal mixed ANN. where w 1 + w 2 = 1. The two weight parameters w 1 and w 2 can be adjusted by the user. If the user increases the value of w2, preference is given to musical tracks that the user has recently heard and given higher scores to. Conversely, if the user increases the value of w1, preference is given to tracks that the user heard in the past and gave higher scores to. The system builds a personal mixed ANN for each user. The scores recorded in the user's profile provide the basis of the training data for the personal mixed neural networks, i.e., the long-term and short-term ANN. The score record contains the music ID, score, and playing date. Through a database search using the music ID, the system first obtains the music features that are associated with it. These features form training data input, which include the basic music features that the user has assigned the score to. It is intuitive to say that the output is the associated score value. The date of the training data for the long-term ANN will be older. The training process uses supervised learning. The bias weight adjustment uses error back-propagation. If the trained personal mixed ANN does not satisfy the user, and the user decides to rebuild the bias weights, the short-term ANN is first retrained with the user-modified score table. The long-term ANN will only be retrained if the resultant short-term ANN cannot satisfy the user. To study the mobility and stability of a car audio system, a tablet is used as the client side platform for the car audio system. Storing the music files, finding the personalized distance function, and the generation of the user interface and other computations all take place on the server side. The client side provides the interface to select the music cluster, handles the data transmission, and plays the music. The simulated car audio system is shown in Figure 8. The simulated car audio system. (a) Simulated car audio system. (b) Prototype in car and user interface (the colored area means that some tracks are clustered to the associated neuron). In the experiment, 560 MP3 music files and associated MIDI files are loaded into the music database. The music genres included rock and roll, blues, country, dance, heavy metal, and pop. Features with 28 dimensions are extracted from the audio and MIDI files. There are 20 enlisted undergraduate students to take part in the experiment. The age of the test subjects ranged from 19 to 23. They had not been trained in music theory and listened to all types of music. The server side is based on an SQL server that records user profiles and rating results. The number of neurons in the SOM is 100, i.e., 10 × 10. The maximum number of songs in the first layer of the HSOM is 50. It halves in the second layer to 25, and so on. where N is the number of pairs selected, and N a is the number of pairs with positive ratings (for human judgment) or with the same genre label (for system judgment). The experiment shows how different values of n and k used in the survey affect the clustering performance when using different feature sets. Users have a web page where they listen to music and answer the survey questions. The method is called MLE. Experimental results are shown from Tables 2, 3, 4, and 5. The average precision is calculated across the 20 users. The average precision using the traditional squared Euclidean distance as the music distance measure for recommendation is 0.35 using all of the features. Moreover, the average precision is 0.23 only using MFCCs features. The proposed method outperforms the simple squared Euclidean distance as long as there are a sufficient number of ratings. This suggests that it is unreasonable to treat each dimension equally when calculating music similarities. Initially, the precision of the proposed method improved as n and k increased. However, after a threshold, the precision increase is insignificant and may even decrease. When users are presented with too many questions, they may lose patience and not give objective ratings. In addition, many candidate tracks have to be rated for each one, and it becomes harder to give clear ratings. Unclear ratings negatively affect the recommendation performance. Comparing the precision of different feature sets, the precision obtained when only using MFCCs is inferior to that obtained when using all features. This result indicates that human input is required to improve the accuracy of clustering, even though it takes more time to process the retrieved information. In addition, the use of different methods to measure precision will lead to different results. If we calculate precision according to whether the music belongs to the same genre, we find that the average precision is lower than when the user decides if the music belongs to the same cluster. From this, we find that most music that is classified as belonging to the same genre is actually perceived very differently by the user. Aside from the above experiments, we carry out a similar experiment on whether there is a common distance function that all users are able to use. This experiment is different from the first experiment as it uses the estimated distance provided by all users to calculate a weighted squared Euclidean distance function. However, the average precisions obtained from the distance function are less than 0.3. In addition, the variation in the multi-dimension parameters for each user's distance function is quite large, indicating the necessity of personalizing the distance function. The second experiment measured the effect of the number of HSOM layers on precision. In the experiment, the maximum number of layers for HSOM is established. When the maximum number of layers is established, even if too many songs are clustered in the same layer, we do not add another layer. In addition, when the experiment selects a pair, it is always chosen from the lowest cluster. According to the previous tables, the values of n and k used for calculating the personalized distance function are 7 and 4, respectively. All of the features are used in this experiment. The experimental result is shown in Table 6. Table 6 shows that a higher maximum number of layers lead to more effective segmentation. However, when considering the ease of use of the user interface, too many layers may lead to users spending excessive time controlling the car audio system. However, if we only use a single-layer SOM, the similar characteristics of the songs may lead to their grouping in certain clusters, making it difficult for the user to select the type of song they would like to hear. Therefore, in subsequent experiments on the operation of the car audio system, the number of HSOM layers is determined by the total number of songs. In other words, when too many songs are grouped in one cluster, we created a new level. As the personal mixed ANN has several parameters that are not easy for the user to determine, including the time period of training data for the short term as well as the weighing of short-term and long-term ANN (i.e., w1 and w2), we tested, under different parameters, the proportion of the songs recommended by the personal mixed ANN using different clusters that the user could accept. where P is the number of tracks recommended by the system and P a is the number accepted by the user. In the experiment, ten songs were recommended to each user under different parameters before the average R _precision value was calculated. The results are shown in Table 7. Note that w2 = 1 − w1 in Table 7. From Table 7, it is clear that the best results are obtained when the time period of training data for the short-term ANN is set to 1 week and w1 = 0.4, w2 = 0.6. The results show that users are more interested in songs that they have recently awarded high scores. The next experiment investigates the time the driver spent operating the audio system while driving. A conventional car audio system was used. Some of the common options offered included selecting a music file using folder selection or file selection. The music files were manually categorized prior to the experiment to provide hierarchical menu lists. One choice for the menu list type is designed to categorize the music files by album. The user can choose a specific album or songs to play via the user interface. Another choice of menu list is designed to categorize music files based on the genres, including classical, folk, opera, jazz, pop, blues, rock, R and B. The user can choose music files within a category or outside a category. The user can choose whether to activate the repeat or random options when selecting the category. The third type of menu list combines the features in the previous two. The user can categorize the music files based on the album and then sort the album based on the genres. The user can have a menu list that contains three layers. In our approach (personal mixed ANNs named as PMANNs), the values of n and k used for calculating the personalized distance function are 7 and 4, respectively. The weights for long-term and short-term ANN are set as 0.4 and 0.6, respectively, and the time period of training data for the short-term ANN is set to 1 week. The user also controls the timing for retraining the personal mixed ANNs. Due to a limited number of devices, the experiment was not performed on real cars, and instead, a simulator was used. The experiment procedure is as follows: the user listens to tracks on the simulated car audio system 1 h every day. To allow a fair comparison of the operation time, each song is cropped to 2 min. When the user hears a song that is not desired, or when a song has finished playing, the user needs to operate the car audio system to select the next song to play. We then perform statistical analysis of the average operation time for each interface for the car audio system within 1 h.
Figure 9 shows the experiment conducted over 6 weeks. Average time spent in operating car audio system in 1 h over 6 weeks. 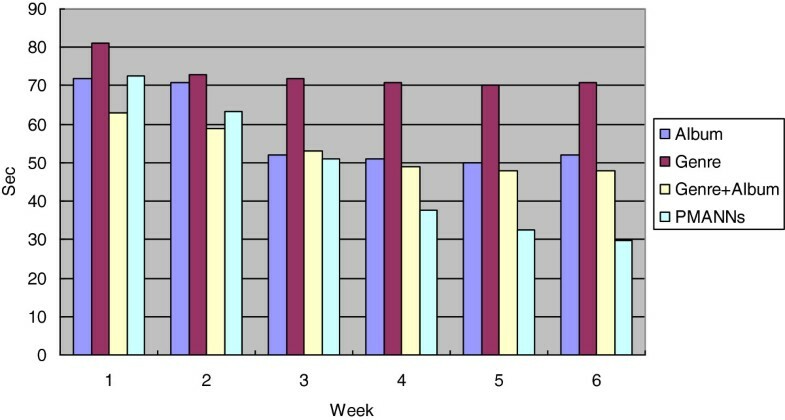 It can be seen from the experimental data that the time spent on each method has reduced as the number of weeks increased. The users gradually became familiar with each interface, which helped to speed up the time taken to locate the desired music files. 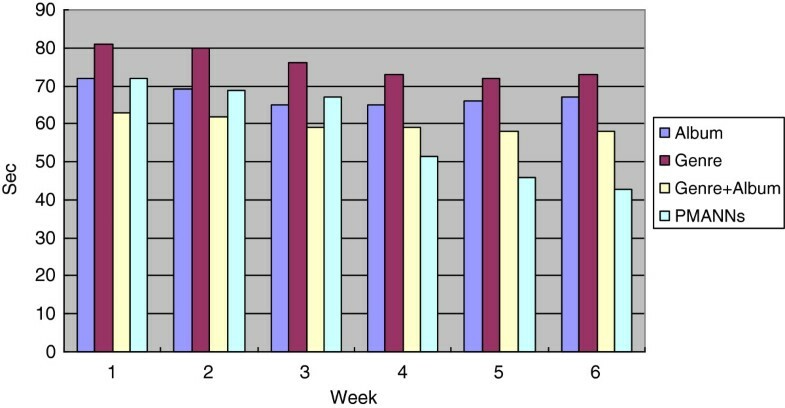 The method we proposed had poor performance in the first 3 weeks; however, from week 4 onwards, the time the user spent on operation was significantly less than that of the other methods. The reason is that after several weeks of data collection, the PMANNs are seen to be able to infer user preferences more accurately. The time spent on operation using conventional interfaces stabilized after 3 weeks. The method using both the Genre + Album required less time. Visual ability is not required when operating the audio system, since the user would have already memorized the interface. Our third experiment uses a camera to measure the time the user takes their eyes off the road to look at the car audio. Figure 10 shows the experiment result. Average time spent looking at the monitor in 1 h over 6 weeks. It can be seen from the experiment data that during the first week, the user needs to look at the audio interface in order to operate it. However, starting from the second week, the user can reduce the time spent on the monitor based on the memories of previous operations. Our method allows the user to select music files using 2D images. The user can rapidly complete the operation by touching specific locations on the touch panel. In contrast, for a conventional operating interface, the user would need to spend an extended period of time interacting with the monitor in order locate a specific song from a long list of the file names, since each genre category contains a large number of songs. Observation of the results from the two experiments described above demonstrates that our proposed method requires the least operation time and requires the least time for the user to look at the monitor. The reduced time allows the driver to concentrate on the road while driving, which reduces the risk of an accident. Along with the rapid development of telecommunications technology and tablet PCs, next-generation car audio systems are being investigated. Making future car audio systems more useful is an important research topic. A new method for music clustering is proposed, and a user interface is designed for such a system, which reduces the interaction needed, while still providing the required music output. First, a personalized music distance function is estimated for each user based on their preferences. This function is then used to perform personalized SOM clustering and generate a personalized user interface by utilizing the ability of the SOM to map data from high-dimensional space onto a two-dimensional plane. The experiments demonstrated that this new interface reduced the average operating time. In addition, ANNs are used to learn user preferences for music and automatically select tracks according to those preferences. This artificial intelligence-based method can reduce the risk of accidents occurring from drivers operating the audio system while in motion. There is still much room for improvement in this car audio system, for example, improving the music distance functions. Further work is also needed to develop a better user interface, in contrast to using a simple grid. In this system, the user needs to complete a questionnaire on similar music tracks, which may create an unreasonable burden. In the future, we plan to increase the number of experimental subjects to establish whether information of the distance function obtained from certain users can be used for the music clustering of other users. For drivers, being able to listen to the music they want to hear without having to operate the car stereo system is our ideal scenario. In the future, we will also carry out research on recommendation systems, for example, the use of collaborative filtering methods to create music streaming schedules. This work was supported in part by the NSC in Taiwan under the contact numbers NSC102-2218-E-020-002 and NSC101-2221-E-020-025.